A Schnauzer /ˈʃnaʊzər/ (German: [ˈʃnaʊtsɐ], plural Schnauzers) is a German dog type that originated in Germany in the 15th and 16th centuries. The term comes from Schnauze , the German word for "snout", because of the dog's distinctively bearded snout. The word Schnauzer also means moustache in German; some authorities, such as Encyclopædia Britannica, say this is the origin of the name. Although the Schnauzer is considered a terrier-type dog, they do not have the typical terrier temperament. They seem to be kinder, calmer, less energetic, and easier to train than a dog such as a Scottish terrier would be. Schnauzers are known for their distinctive beards and long, feathery eyebrows. Typically, they are shaved down the back while the hairs on their legs are kept long and curly. Some show-schnauzers have their back hairs 'stripped' by hand. It is traditional to have the tails trimmed and the ears clipped to give an alert appearance. 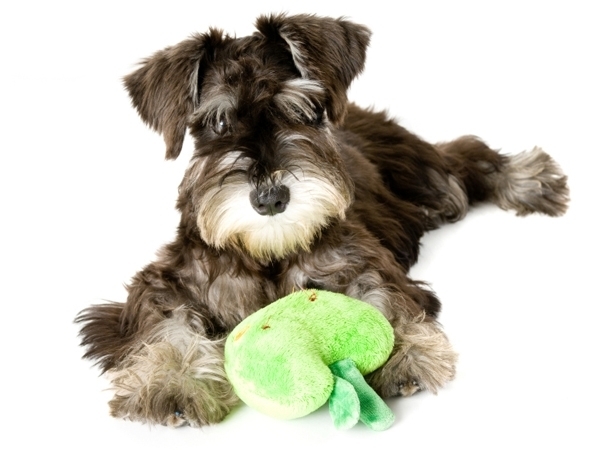 The Schnauzer's beard and leg hair should be brushed often to prevent mats from forming. Schnauzers have a double coat. The top or guard coat is wiry, while the undercoat is soft. Stripping removes the undercoat and stimulates the hard top coat to come in fuller. The undercoat coat should be "stripped" (loose, dead hair is plucked) at least twice a year. A stripped schnauzer will have a hard wiry coat as described in the breed standard . A shaved pet will lose the hard top coat and only exhibit the soft undercoat. Schnauzers are a breed of dog that sheds less often than most dogs but is not hypoallergenic, as allergies are caused by dander. Dander can be controlled by feeding your dog a higher quality diet, and grooming it frequently.